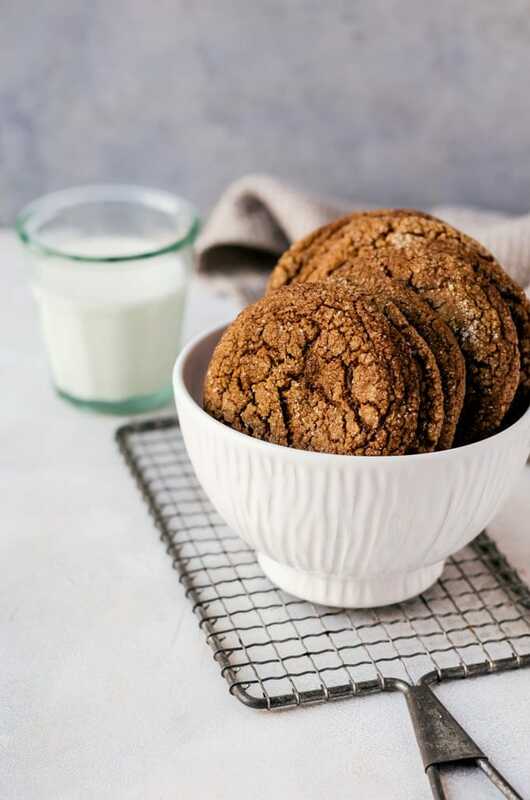 These flavorful chewy molasses cookies are nothing like what you’ve had in the past. Perfectly balanced flavors meet in an irresistibly chewy cookie that is perfect for dunking! So I don’t know what’s up with me, but I’ve been wanting all the holiday things. Not just Halloween things, but all things holiday. It’s like fall came and a flip switched in my brain and I’m singing some weird mash-up of “This is Halloween” and “Here Comes Santa Clause.” It’s not pretty, but it is what it is. 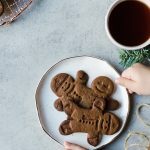 And that’s why today, I am sharing with you one of my favorite Christmas cookies. A soft, chewy, molasses cookie that is totally irresistible, especially when there is a glass of milk within dunking reach. I’ve always loved molasses cookies, but never had my own go-to recipe. I mean, there was one recipe, but it was so inconsistent and they’d come out completely differently every time. I am proud to say that I finally have a go-to recipe that I will use forever, and yes, they come out perfectly every single time. You know why? 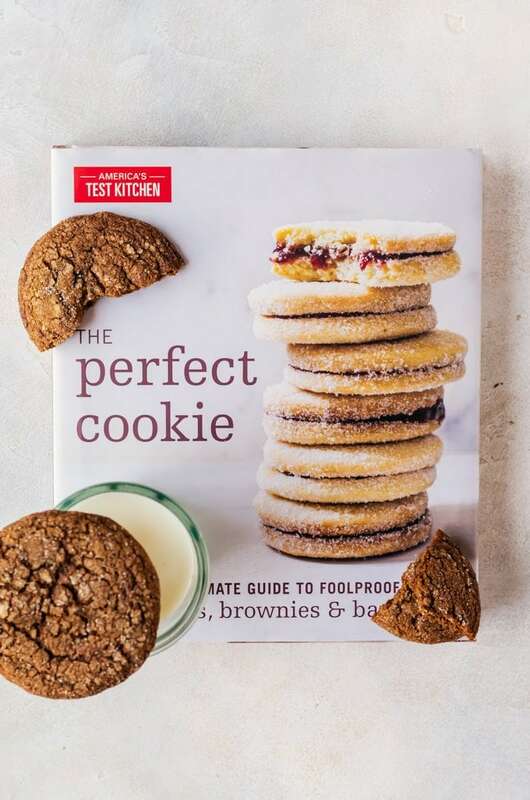 Because it’s from The Perfect Cookie cookbook by America’s Test Kitchen and you know you can’t go wrong with a recipe from them. We learn to keep the flavor balanced with real butter, brown sugar, and light or dark molasses. That blackstrap molasses should never be used because the flavor is over powering and can be off-putting. 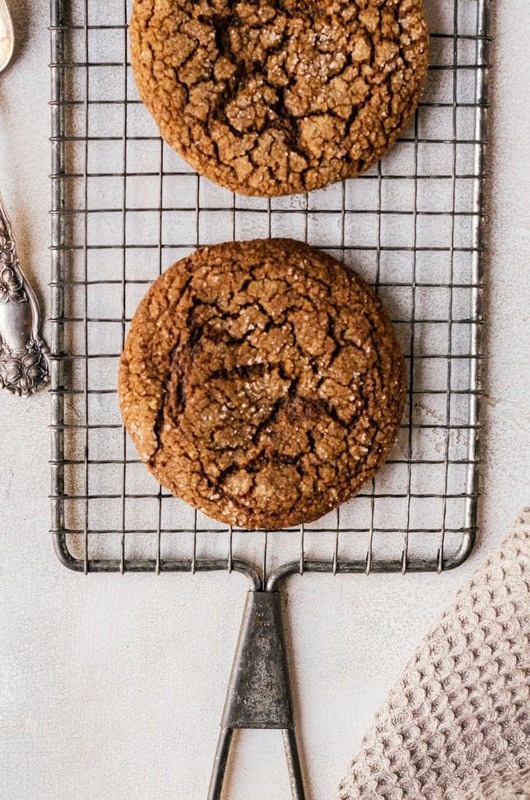 And like with a perfectly chewy chocolate chip cookie, your molasses cookies should be slightly under baked when you remove them so they edges will stay crispy and the middles become irresistibly chewy. I have to confess that I’ve never has a molasses cookie this good before. thew chewiness alone made me grab two or three cookies at a time for me to snack on. I am probably responsible for an entire batch of these chewy molasses cookies disappearing. This cookie is so good, I can easily see myself baking them almost year-round (you know, provided it’s not too hot to turn on the oven for any reason). Once you’ve had one, I know you will end up agreeing! 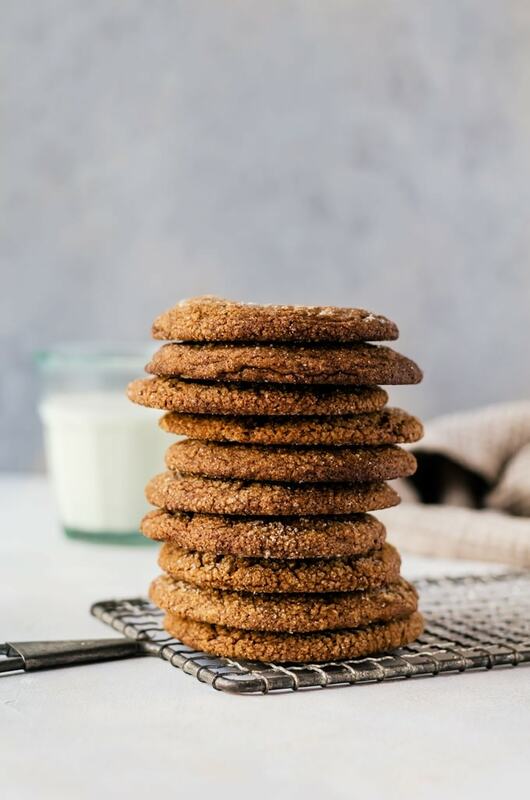 These soft, chewy molasses cookies will be your new holiday cookie favorite to bake! Preheat the oven to 375 degrees F. Line two baking sheets with parchment papers or baking mats. In a medium bowl, mix together the flour, baking soda, cinnamon, ginger, cloves, allspice, pepper, and salt together. Set aside. In a mixer, add the butter, 1/3 cup of granulated sugar, and brown sugar together. Beat until light and fluffy, about three to four minutes. Add in the egg yolk and vanilla and beat for an additional minute before adding the molasses and beating for another two minutes, or until everything is one single color. Scrape the sides and bottom of the bowl as needed. Pour in the flour mixture and mix until everything is just incorporated and there are no streaks of flour. Add the remaining granulated sugar in a small bowl. 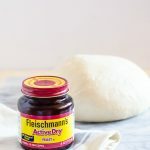 Dampen your hands and portion out two tablespoons of dough. Roll the dough between your damp hands to form a ball, then roll the ball in the sugar until completely coated. Repeat with all of the dough. Place the balls of cookie dough two inches apart on your baking sheets. Bake the cookies one baking sheet at a time for about 11 minutes, or until the cookies have begun to set at the edges, but are still puffy in the centers and still look underdone in the middles. Allow the cookies to cool on the baking sheet for five minutes, then transfer to a wire rack to cool completely. Hi Louise, something must have happened during publishing. 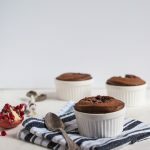 I am using a new program to insert the recipes, and there are still some kinks that need to be worked out. I’ll get that fixed asap!! Can’t wait to get the ingredient list! Suspense is building! It’s since been updated. There was an issue with the formatting! I think I have bit of different cup than US .. Can you point me please in Metric Unit? Just about these ingredients.. Granulated Sugar, Flour and Butter? I have found something but simply I could not rely on. How much pepper and all spice? I just made these cookies tonight, they were so amazing! They come out looking perfect too.